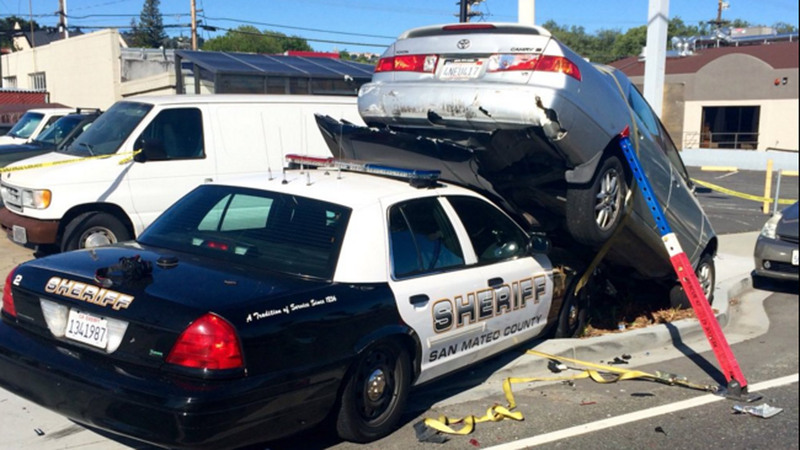 SAN CARLOS, Calif. (KGO) -- A crash involving a San Mateo County sheriff's patrol car is under investigation. The patrol car ended up underneath a Toyota Camry after a sergeant chased the vehicle. Investigators say the same car drove into a fire station and a Safeway store earlier. No one was seriously hurt. The crash occurred at El Camino Real between Olive and Arroyo streets. The patrol car was loaded onto a flatbed and hauled away. Southbound lanes of El Camino Real were temporarily closed.